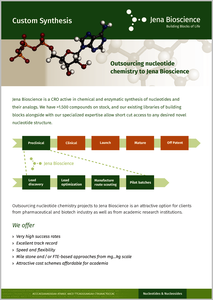 Jena Bioscience is the leading supplier for Nucleotides and their analogs. We have more than 2.000 of natural and modified nucleotides available on stock. Natural and modified nucleoside analogs (i.e. nucleobase linked to a sugar moiety but lacking the phosphate groups). In addition, with our pre-made building blocks and in-house expertise we manufacture even the most exotic nucleoside and nucleotide analog from the mg to kg scale in a Custom Synthesis. 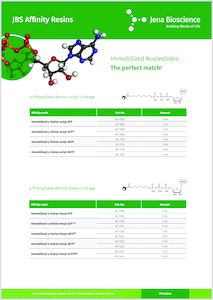 If you work with nucleosides or nucleoside analogs and want to have them phosphorylated, please contact us. We are able to provide this service at competitive pricing with tournaround times of 1-2 weeks. For your convenience we offer most nucleotides as 10 mM aqueous stock solutions (pH 7.5) which is ideal for most applications. Most nucleotides are available as small (S) and large (L) packs, with an L pack equal to five S packs. Thus, when ordering an L pack, you may receive five individual S packs. Unless stated otherwise, all our nucleotide preparations are long-term stable when stored at -20°C. If you require large amounts (> 5 L packs) please contact us for special discounts. Tubes contain only few microliters of precious nucleotide solution. In order to avoid losing liquid in the cap, we recommend spinning down the tube in a bench-top centrifuge before opening. Nucleotide solutions/lyophilisates are not guaranteed to be sterile. We recommend aliquoting nucleotide solutions in case they are not used up with one application, so repeated freeze/thaw cycles are avoided. Aliquotation should be carried out quickly and the aliquotes should be frozen again immediately. All nucleotides can be delivered pre-aliquoted according to your specifications - please contact us for a custom quotation. 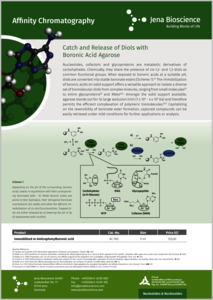 You have interesting nucleotide analogs and want to commercialize them? We can help you! Please contact us for details!